Dad knew how to get through our childhood – and childish – brains, and in our later years, he continued to impact my life and that of my brother Don, and my sister, Mary. Without a doubt, the combination of mom’s and dad’s parenting styles really and truly prepared us for adulthood and made us the well-rounded, caring, accepting adults I believe we’ve grown up to be. 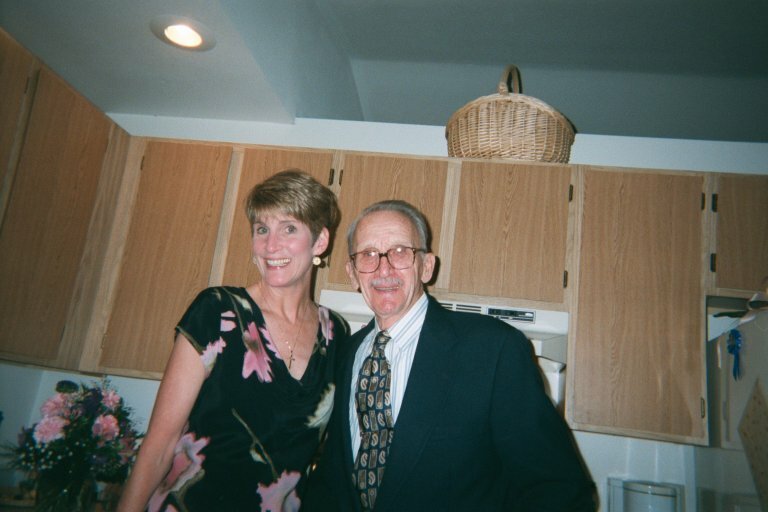 When Dad died from Alzheimer’s on October 13, 2007, a huge void was left in our lives. 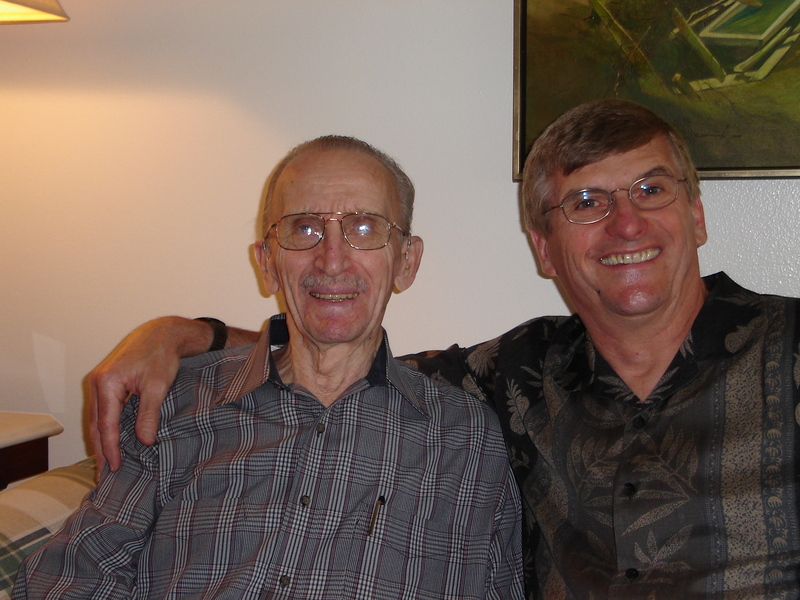 My wonderful brother Don, and our dad in June 2005, a year after dad’s Alzheimer’s diagnosis. Some would say that at 39 years of age, my brother got married later than most. What can I say? He found the love of his life, Nancy Satterberg, in 1987. I’m pretty sure up to that point, no one else qualified for the love Don had for his wife. My brother was, and is, an involved and loving part of his three stepchildren’s lives. Just the other day, his youngest son, who is preparing for his upcoming wedding, told Don that he always considered him as his second dad; not a stepdad, not a replacement for his biological father, rather, a second dad. Per and his siblings, Sten and Kirsten, were fortunate in that way. Don was also a caregiver for his wife who died from Alzheimer’s on July 4, 2012. He was the epitome of an involved, loving, attentive provider of care for the wife with whom he would have celebrated his 25th wedding anniversary in September of 2012. Jerry has two daughters, Lainey and Kirstin, and lest you think he ever hoped and wished for a son rather than those two, you would be sorely mistaken. There were no gender limits when it came to actively participating in his daughters’ lives. Hell no! There were hikes, softball games, soccer matches, woodworking training…you name it, he shared his knowledge and interests with them and they benefitted greatly as a result. My husband’s reserved and unassuming manner camouflages the extraordinary love he has for Lainey and Kirstin. His care about their well-being, happiness, and health is evident in all that he does for them, and in the ways he thinks about them and talks to them. 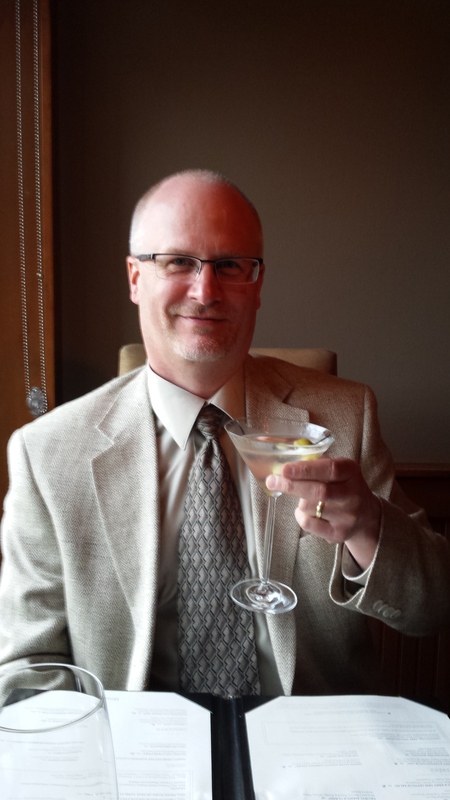 Unlike myself, who tends to be a bit overbearing and sometimes far too transparent, my husband exhibits strength and concern by the way he demonstrates his commitment and dedication to his daughters, to me, and to all those whom he considers dear to him. Jerry is a man of few words but when he speaks, every spoken word is worthy of your undivided attention. I’m the luckiest woman alive to have him as my husband. Happy Father’s Day in absentia, Dad. Happy Father’s Day fabulous brother of mine. Happy Father’s Day Jerry – the man with whom I chose to spend my life on February 10th, 2000. This entry was posted in 21st Century Living, Alzheimer's/Dementia, Caregiving, Health & Wellness. Thank you Irene for such a loving and gracious ode and tribute to our wonderful and caring Dad, and your amazing and generous hubby. As for me, I feel incredibly enriched and blessed to have been a loving husband to Nancy, and – now and always – a loving step father to Kirsten, Sten and Per, and of course “Papi” to my grandson Beckett! We’re all blessed to have you in our lives, Don. What a beautiful tribute, Irene.